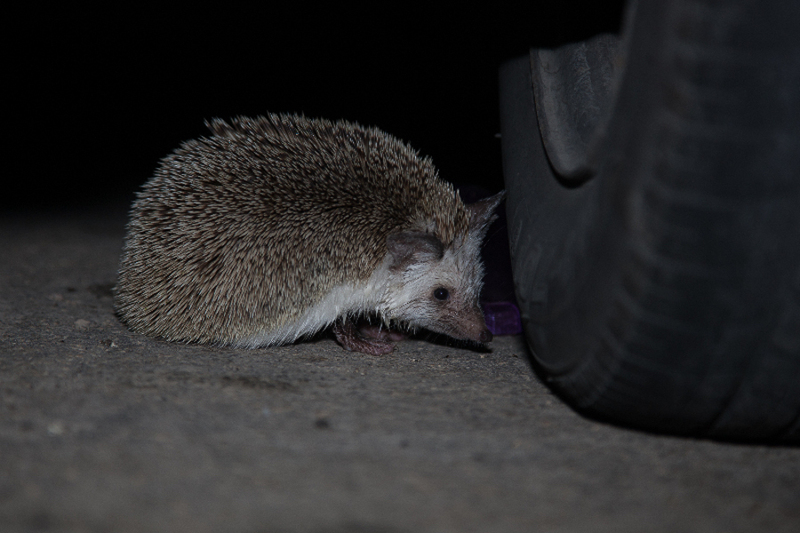 Whilst in Dhahran main camp Phil Roberts found a Desert Hedgehog in his garden where he took the below photo that he has kindly allowed me to use on my website. The Desert Hedgehog is a species found in northern Africa, from Morocco & Mauritania in the west to Egypt in the east as well as the Middle East including Israel, Jordon, Syria, Iran, Iraq, Kuwait, Saudi Arabia, United Arab Emirates, Oman & Yemen. A typical hedgehog in appearance the Desert Hedgehog has a dense, spiny coat, an elongated snout and the ability to curl into a defensive ball when threatened. Its most distinctive feature is the contrasting dark muzzel and broad white, spineless band across the face, which extends onto the flanks. The ears are relatively short and rounded and like other members of the genus, there is a naked patch on the forehead. The legs are long and dark and the underside is softly furred and is usually a mixture of black, brown and white while the spines on the back are a light colour with two dark bands. The overall colouration is quite variable, with some individuals almost totally white, and others completely dark. It is one of the smallest of hedgehogs being 14 - 28 cms in length and weighing 285 - 510 grams. As its common name suggests, the Desert Hedgehog inhabits dry deserts, dry steppe and other arid terrain and often favours areas such as oasis and vegetated wadis where food is more readily available. It has also been recorded in gardens, cultivated areas, open woodland and parks like the areas it is found in Dhahran Camp. It is active at night, is solitary and forages on the ground for a range of insect and other invertibrate prey, as well as occasionally small vertibrates and even species such as scorpions, spiders and snakes. They enter hibernation between January & February, when the temperatures are cooler and may also become less active during the hottest months and when food is scarce.